Don’t we just love a Real Wedding? I just had to ask one of my brides from last year to be featured as her wedding day was so fab! I can’t wait for you to read all about Stephanie and Daniel‘s big day! Steph and Daniel met on Match.com (side note: I know soooo many couples who have gotten married from meeting through that site!). He lived in Bolton, she was in Liverpool, so they may have never met if it wasn’t for online dating. met with a single cream rose. I thought how sweet! As I reached him he said lots of lovely things about how much he loves me (I will spare you the soppy details) and said he had been told that this was the nicest smelling rose in Liverpool. As he held it for me to smell, there was a sparkly diamond ring inside! He then got down on one knee and I obviously said yes. It was the best way he could have asked me as Gusto is so important to us (even our dog is called Gusto!)”. They spent 2 years planning their wedding. Steph says, “I absolutely loved every minute of planning my wedding so doing it for 2 years was a joy. If you book so far in advance, you get the pick of the services you want as things get booked up so quickly!”. She used the Bride to Be wedding planner from BusyB.co.uk to keep all of her wedding planning organised. “I kept everything to do with my wedding in it – leaflets, contacts, notes, receipts and it has helpful sections for you to complete to keep all your information together and it has timelines of when to get things done, which is helpful. I highly recommend it.”. They based their theme around the beautiful bridesmaid dresses, romantic dusky pink with lots of sparkle and lots and lots of roses! Roses are very special and significant to them as a couple. When choosing flowers, they went to Foam Flowers by Joanne in Maghull. “I decided to go for artificial because I wanted my bouquet to look fresh all day and I wanted to be able to keep it. It is now proudly displayed in a vase in my living room, which I love. Artificial flowers look so real now and my bouquet is amazing! I also had a charm made for my bouquet by Save The Date By Lily, which had a picture of my Nan on who sadly passed away 3 years ago. It was important to have her there with me in some way and this was absolutely perfect.”. Steph chose a fabulous princess style dress from Natalie Ann Brides, “I loved my dress! I wanted a princess type dress from the beginning and I wanted it to be big. When are you ever going to wear a massive dress in your life again? Never! I went to lots of different shops and tried on lots of different dresses and I loved every second of it. But once I found my dress, I knew it was the one for me. It had a big tulle skirt, gorgeous lace and sparkles, so a bit of everything I wanted. I would advise brides to enjoy the experience and try on as many as you can because when you find the one, you can’t try anymore on!”. Looking like a princess also influenced her hair style, which was done by Hair By Jess. “I wanted lots of curls for my hairstyle so I had half of my hair up and half down. 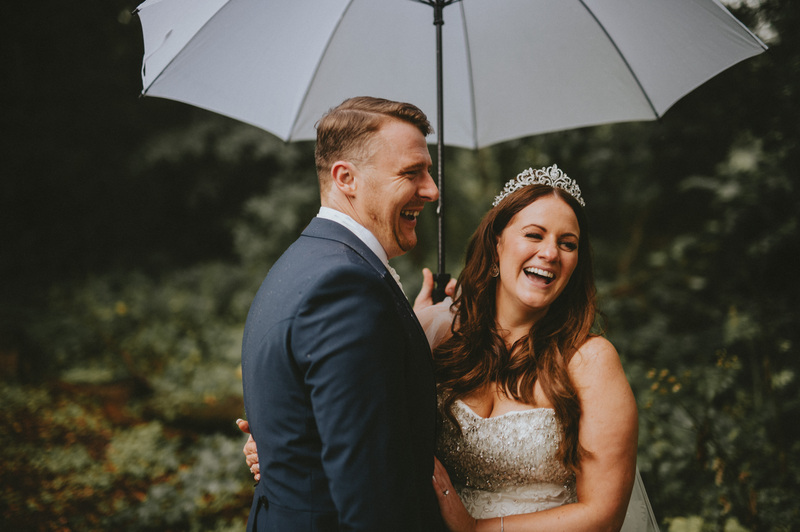 I picked a big sparkly tiara and loved wearing it all day.” For her makeup, Steph wanted to accentuate her natural look with a hint of glam, “Vicky at Glamorama Makeup was just amazing from the moment I met her. She was so happy and friendly and really listened to what I wanted. My make up was flawless all day, even through rain and humidity! I still had a lovely glow at the end of the day.”. They had both photography and videography to capture their day. Steph says, “My photographer was James Revitt of Flawless Photography. I looked at so many photographers and each is so different. I discovered James at a wedding fair and I loved how arty his photographs. I was really looking for natural shots, I didn’t want to have posing shots. This was completely his style, natural and shooting from afar. We had an engagement shoot a couple of months before the wedding and this really did help him to get to know us and us to get to know his style and it made the wedding day pictures much more natural. He is so incredibly passionate and really will go to great lengths to get a good shot. I absolutely adore my photographs they are what I wanted and more.” LoveTwoFilm provided the videography, “My videographer was just amazing. His name is Bruce from LoveTwoFilm and I found him at a wedding fair. I loved his style of filming, almost like a T.V documentary. He was such a nice guy and worked hard to film every aspect of the day. I feel like he completely captured the atmosphere of our day perfectly and I can relive the day just watching the video. I am so glad we have the video and would highly recommend him to other brides.”. They also had a very unique and fun music video made during the course of the wedding day! “One of the best things I did was have a music wedding video made (Music Wedding Videos is the company). You choose a song and the videographer gets your guests to sing along to the song and then puts all the clips into a music video. The result is amazing! He also captured all the special aspects of the day as well as the singing and the video is just fabulous and it really kept the guests entertained.”. How cool is that??? of cake, cascading roses, our initials and some glitter. I adored my cake and have kept the bottom tier, which was fruit cake, for a christening cake in the future. We shouldn’t be waiting too long as our first baby is coming along in July!”. Music and entertainment is also of major importance for most couples, “Music is really important to us and so we felt we wanted music throughout the day. We had a string band called Strings Attached from Good Indeed Music for our ceremony and playing to guests during the reception. During the wedding breakfast we had a pianist from PianoDJ, which created a lovely relaxed atmosphere. In the evening we had Funk Soul Family, a band from Good Indeed Music, who kept the party going with their amazing music. We also had an Ice Cream cart in the daytime (The Ice Dream Experience), which seemed to entertain everyone!”. When it comes to those special, personal touches of their wedding day, Steph had this to say, “I suppose as for most people, the music we picked was so personal to us. The walking down the aisle song and first dance in particular were just so special to us. I made all of our wedding favours individually too so I think that put a personal touch into the wedding. Our guests commented on how you could tell it was our wedding, which is what I wanted. Weddings can be generic and it is important to put your stamp on things. My Dad did something very special, he had a recording made of him singing ‘Your Song’ in which he changed the lyrics to make it personal to me and my husband. We had our father/ daughter dance to it and it was just so special. It was all so amazing, I loved every second of the day. But our first dance was a particularly special part of the day for me. When our song came on (K.C and JoJo All My LIfe) I became very emotional, which I had managed to control all day. I swear for the length of that song it felt like everybody left and it was just my husband and I in the room and I felt every word of the song. It was so romantic and such a special time for us.”. The couple booked their fabulous honeymoon through Kuoni, whom they highly recommend thanks to their incredible service. “We went to Las Vegas for 5 days then to Jamaica for 11 days.It was the most amazing honeymoon I could have ever wished for. Vegas was a busy break but we did so much – shows, a helicopter ride to the grand canyon, a concert as well as sightseeing. Then Jamaica was just completely romantic bliss. We stayed at Secrets Wild Orchid in Montego Bay and I highly recommend it as a honeymoon destination. Absolute luxury.”, explains Steph. Sounds like the holiday of a lifetime! Steph and Daniel’s wedding sounds like a fairy tale come true! The only thing she would have changed would be to have worn her hair up, because of the rain, but she felt that everything else was completely perfect. Their best advice for couples getting ready to tie the knot? “Just enjoy every moment and be as organised as you can. But no matter how organised you are, the week before will still feel like a mad rush! People tell you to take some time out with your new husband/wife even if it is 10 minutes. We never managed this but it would have been nice so definitely try!”. Congratulations on your marriage and on the little baba that is on the way! And thank you for letting us feature you on the blog. I really enjoyed spending the morning with you and your wedding party, getting everyone glammed up for your incredible wedding day!